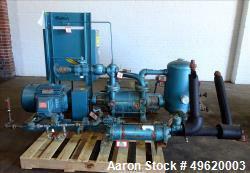 Below is Aaron's inventory of unused and used vacuum pumps. 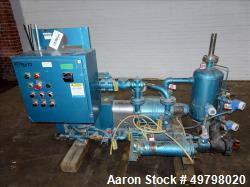 If you are looking to sell your used vacuum pump submit a request online or contact Erik Eichert at 630-238-7480. 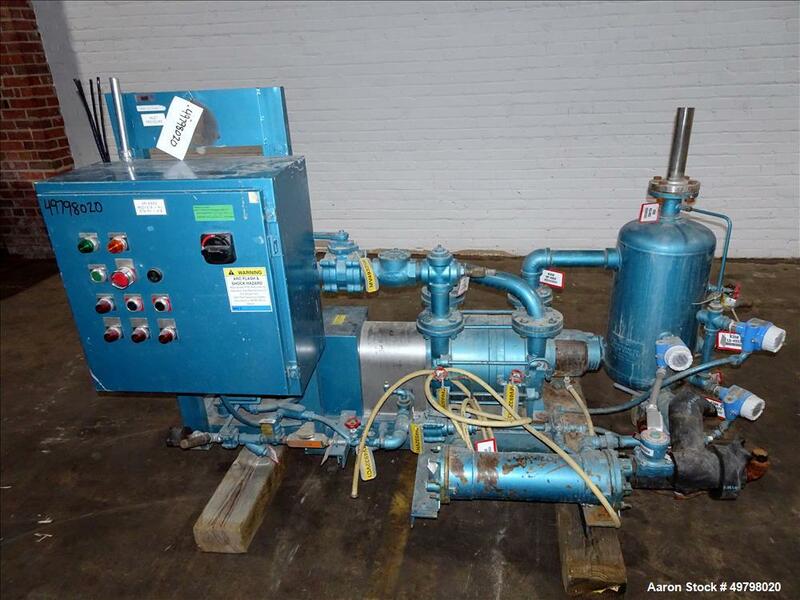 Used- Single Stage Liquid Ring Vacuum Pump, Model NBE1-102. Used- Single Stage Liquid Ring Vacuum Pump, Model NBE1-102. Direct drive 1450 r/min, 6 kW, 33mbar, 246 cubic meters/hr, 4.1 cubic meters/min. V-Belt Drive 1750 r/min, 8 kw, 33mbar, 290 cubic meters/hr, 4.8 cubic meters/min. Mfg. 2014. 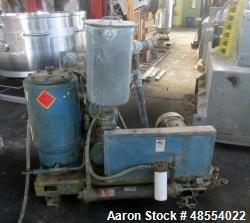 Used- Rosenmund Apovac Vacuum System, Model Horizontal Apovac 2510. Used- Rosenmund Apovac Vacuum System, Model Horizontal Apovac 2510. 25 hp motor, Vessel MAWP FV at 90 psi at 300 degree F, MDMT -100 degree F at FV at 90 psi. National Board # 1810. Serial # 97-SU-424//W9451. 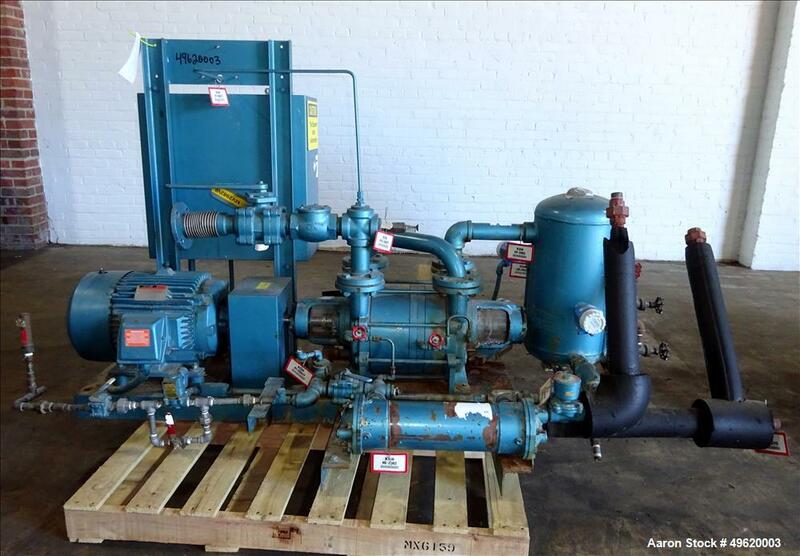 Used- Kinney 2 Stage Liquid Ring Vacuum Pump, Model KLRC-200S, Carbon Steel. Approximate 200 ACFM at 1750 rpm. 2" Inlet & outlet. Driven by a 15 hp, 3/60/230/460 volt, 1765 rpm motor. Serial # 93-0359/930414, Part # 077631-K06S. 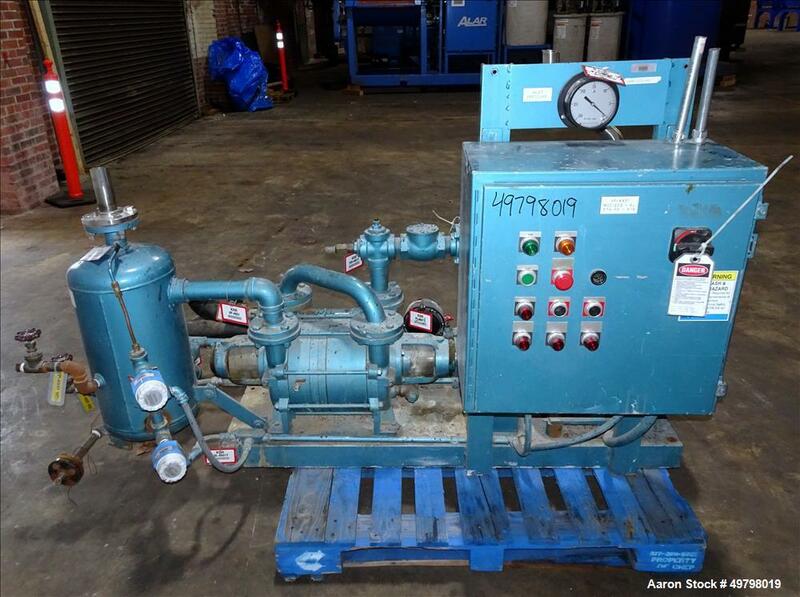 Includes a separator tank, heat exchanger and a control panel. Frame mounted. 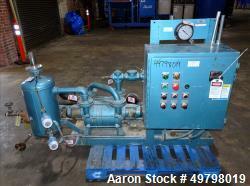 Used- Kinney 2 Stage Liquid Ring Vacuum Pump, Model KLRC-200S, Carbon Steel. Approximate 200 ACFM at 1750 rpm. 2" Inlet and outlet. 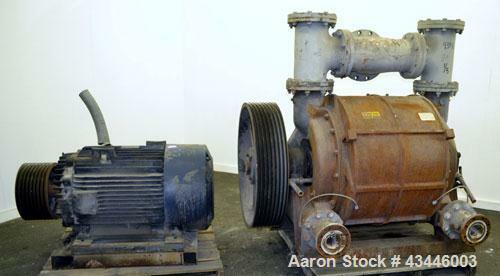 Driven by a 15 hp, 3/60/230/460 volt, 1765 rpm motor. Includes a separator tank, heat exchanger and a control panel. Frame mounted. Used- Kinney 2 Stage Liquid Ring Vacuum Pump, Model KLRC-200S, Carbon Steel. Used- Kinney 2 Stage Liquid Ring Vacuum Pump, Model KLRC-200S, Carbon Steel. Approximate 200 ACFM at 1750 rpm. 2" Inlet & outlet. Driven by a 15hp, 3/60/230/460 volt, 1765 rpm motor. Serial# 93-1085/930375, part# 077631-K06S. 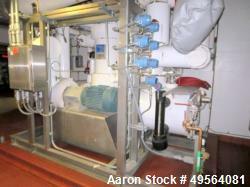 Includes a separator tank, heat exchanger and a control panel. Frame mounted. 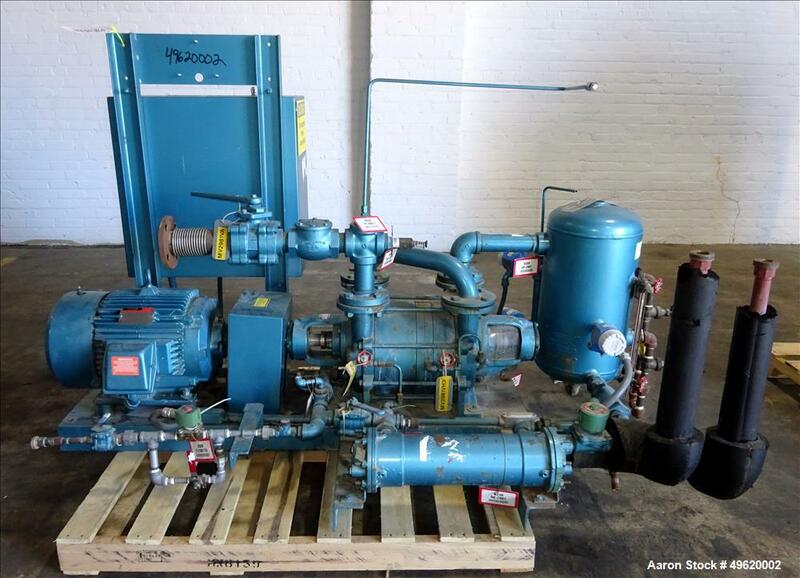 Used- Kinney 2 Stage Liquid Ring Vacuum Pump, Model KLRC-200S, Carbon Steel. Approximate 200 ACFM at 1750 rpm. 2" Inlet AND outlet. Driven by a 15 hp, 3/60/230/460 volt, 1765 rpm motor. Serial # 93-0359/930713, part # 077631-K06S. 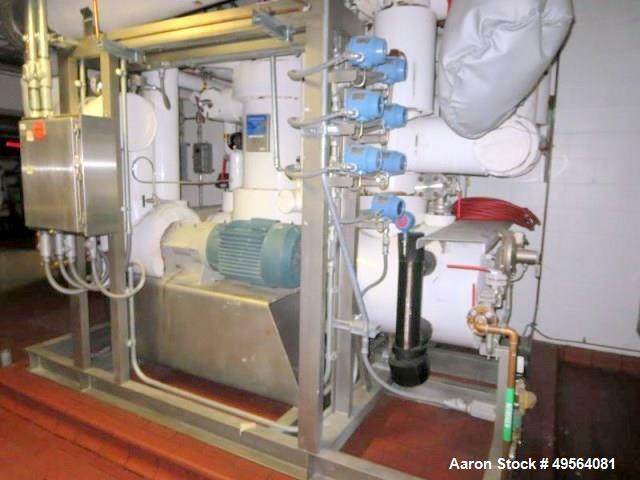 Includes a separator tank, heat exchanger and a control panel. Frame mounted. 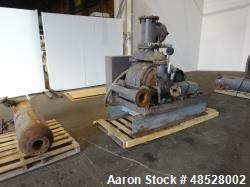 Used- Leybold-Heraeus Rotary Piston, Oil Seal Vacuum Pump, Model DK50. 25 mm Inlet, 38 mm outlet. Driven by a 1.5 kw, 3/50/500 volt, 1410 rpm motor. 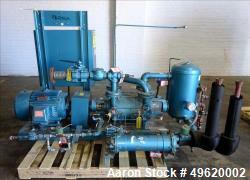 Used- Nash Elmo Liquid Ring Vacuum Pump, Model CL-2001, Carbon Steel. Approximate capacity with a 125 hp motor is 2120 CFM at 15" HG. 6" Inlets, 5" outlets. Requires a motor. Test# 88U0837. 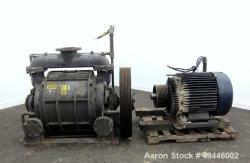 Unused- Nash CL Series Liquid Ring Vacuum Pump, Model CL-1003, Carbon Steel. Approximate capacity with a 50 hp motor is 950 CFM at 20" HG, maximum 880 rpm. 5" Inlets, 4" outlets. No motor. Test# 11K042434002001. Built 2011. Used- Nash CL Series Liquid Ring Vacuum Pump, Model CL-1002, Carbon Steel. Used- Nash CL Series Liquid Ring Vacuum Pump, Model CL-1002, Carbon Steel. Approximate capacity 800 CFM at 23" H.G., maximum 690 rpm. 5" Inlets, 4" outlets. Driven by a 50hp, 3/60/208-230/460 volt, 1765 rpm motor. Mounted on a carbon steel frame. Test# 75U-5412, built 1975. 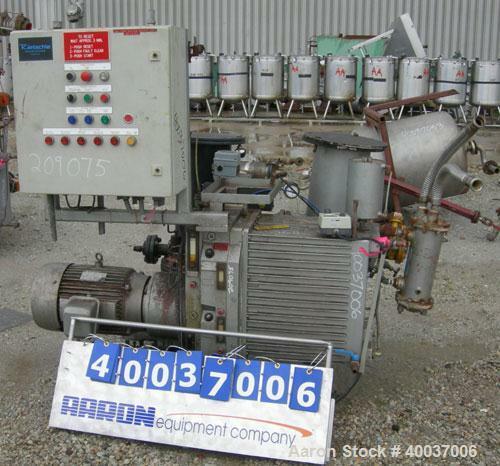 Used- Nash Hytor Liquid Ring Vacuum Pump, Model 1002, Carbon Steel. 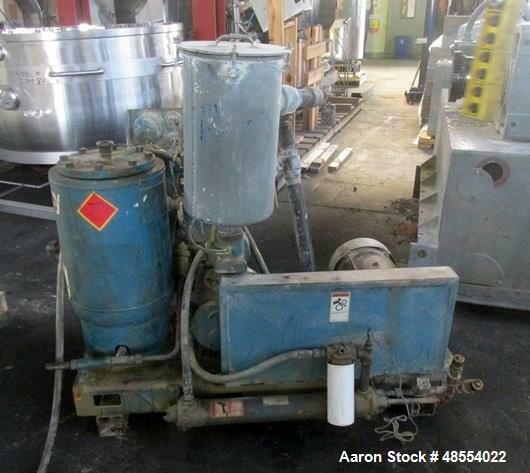 Used- Nash Hytor Liquid Ring Vacuum Pump, Model 1002, Carbon Steel. Approximate 800 CFM at 23" HG at 690 rpm. 5" inlet, 4" outlet. Driven by 50hp, 3/60/200 volt,1765 rpm motor. Mounted on a carbon steel frame. Test#72U0480, built 1972. Used- Nash Hytor Vacuum Pump, Size 202, Product Code 14510020200000, Carbon Steel. Approximate capacity 160 cfm at 16" H.G. at 2000 rpm. Driven by a 15hp, 3/60/200 volt, 1755 rpm motor. Mounted on a carbon steel frame. Test# 70U-4276, built 1970. 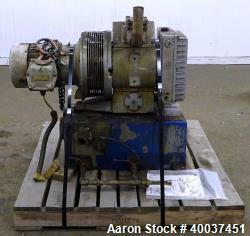 Used- Nash Vacuum Pump, 14520040300000D, test #70U-5813. Driven by a 25 hp, 3/60/230/460 volt, 1160 rpm motor. 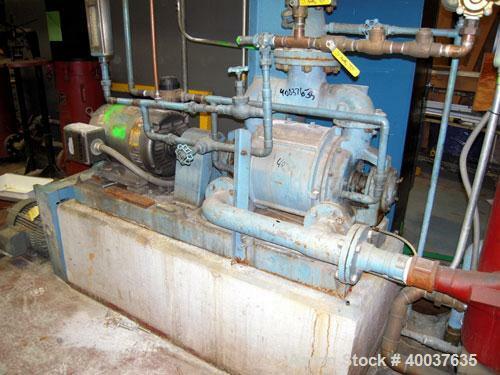 Used- Nash Liquid Ring Vacuum Pump, Model CL2003, Carbon Steel. Approximate 2120 CFM at 15" HG, at 590 rpm. Driven by a 125hp, 3/60/460 volt, 1780 rpm motor. 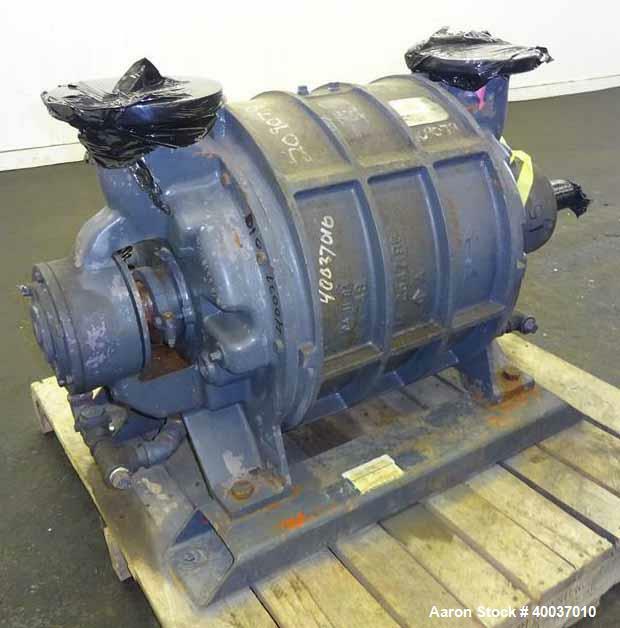 Used- Nash Liquid Ring Vacuum Pump, Model CL3003, Carbon Steel. Approximate 2600 CFM at 25" HG, at 500 rpm. Driven by a 200hp, 3/60/460 volt, 1190 rpm motor. 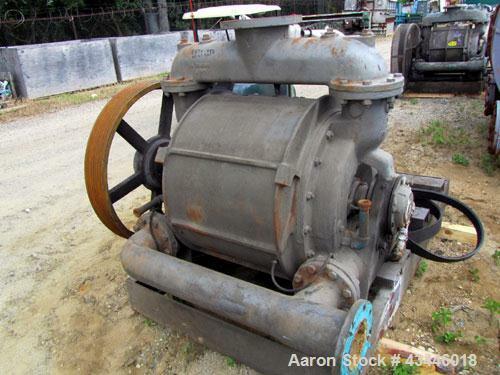 Used- Nash Liquid Ring Vacuum Pump, Model CL2003, Carbon Steel. Approximate 2120 CFM at 15” HG, at 590 rpm. Driven by a 125hp motor. 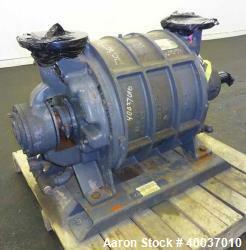 Used- Nash Liquid Ring Vacuum Pump, Model CL2003, Carbon Steel. Approximate 2120 CFM at 15" HG, at 590 rpm. Driven by a 125hp motor. 3/60/460 volt. 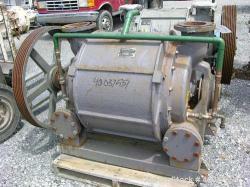 Used- Nash Liquid Ring Vacuum Pump, Model CL-3003, Carbon Steel. 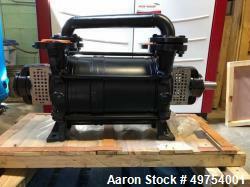 Range from 2700 cfm at 21" of vacuum to 1900 cfm at 27.5" of vacuum, with 200 hp, 460 volt motor, belt driven, test # 92S0169. 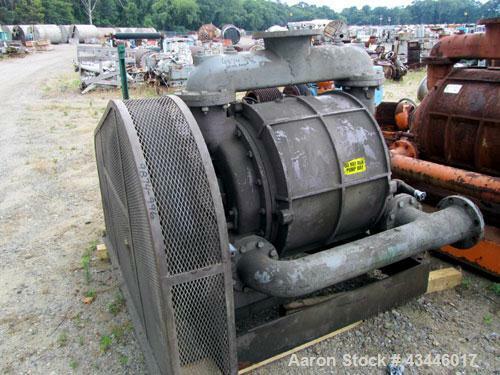 Used- Nash Vacuum Pump, Type CL1003. Approximately 330 cfm at 100 mm hg, carbon steel. Test number 84U2740, 690 rpm. Requires motor. 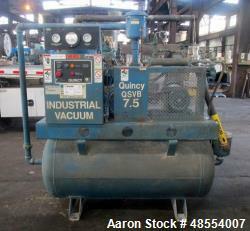 Used- Quincy Vacuum Pump, Model QSVB7.5WNN3C. Nominally rated 155 cfm at 29.9" of vacuum. Driven by a 7.5 hp, 230/460 volt motor. Serial# 96307. 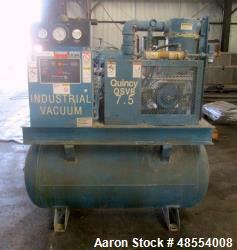 Used- Quincy Vacuum Pump, Model QSVB7.5WNN3C. Used- Quincy Vacuum Pump, Model QSVB7.5WNN3C. Nominally rated 155 cfm at 29.9" of vacuum. Driven by a 7.5 hp, 230/460 volt motor. Serial# 99387H. 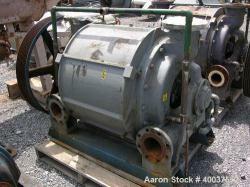 Used- Quincy Vacuum Pump, Model QSVB10WN3C. 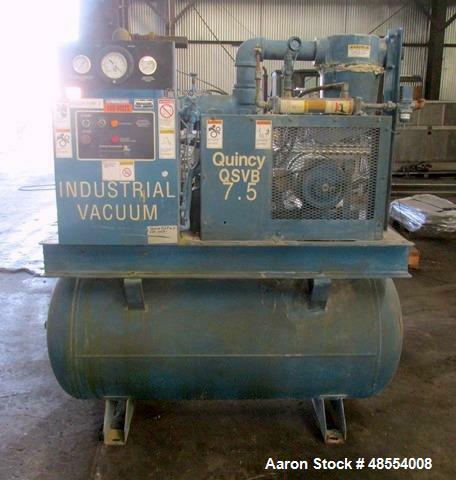 Used- Quincy Vacuum Pump, Model QSVB10WN3C. Nominally rated 196 cfm at 29.9" of vacuum. Driven by a 10 hp, 230/460 volt motor. Serial# 38145. 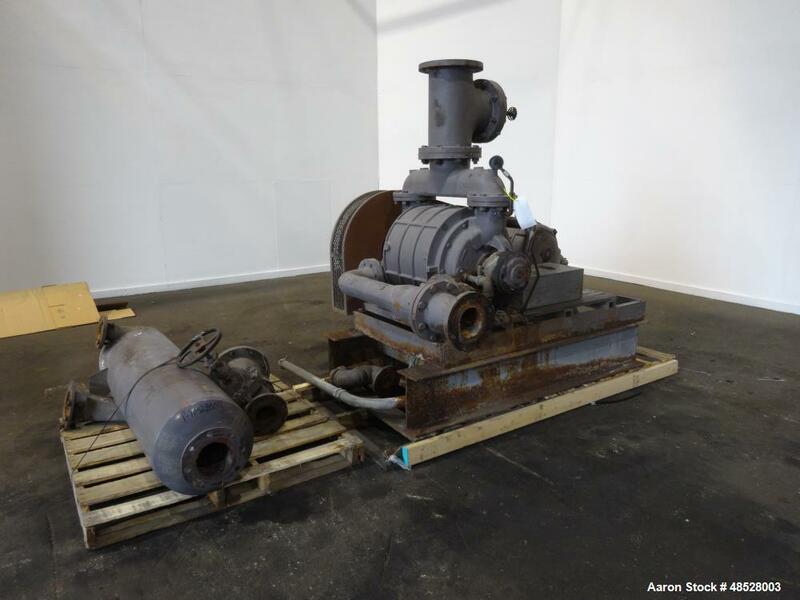 Used- Rietschle Oil Seal Mechanical Vacuum Pump, Type VLB-100-(03), Carbon Steel. Approximately 58.86 cfm at 225 torr. Driven by a 5hp, 3/60/230/460 volt, 1735 rpm XP motor. Mounts on a holding tank. Serial# 1283689, built 1990. 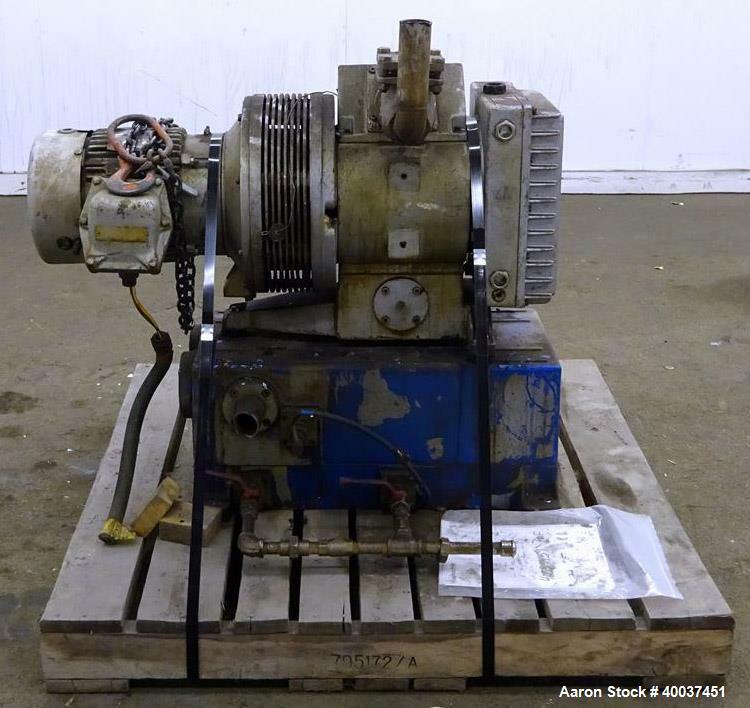 Used- Rietschle Oil Seal Vacuum Pump, Type VWZ402-16M. Approximately 283 cfm at 375 TORR. Driven by a 20 hp, 3/60/230/460 volt, 1755 rpm XP motor. Includes control panel and tanks. Base mounted. 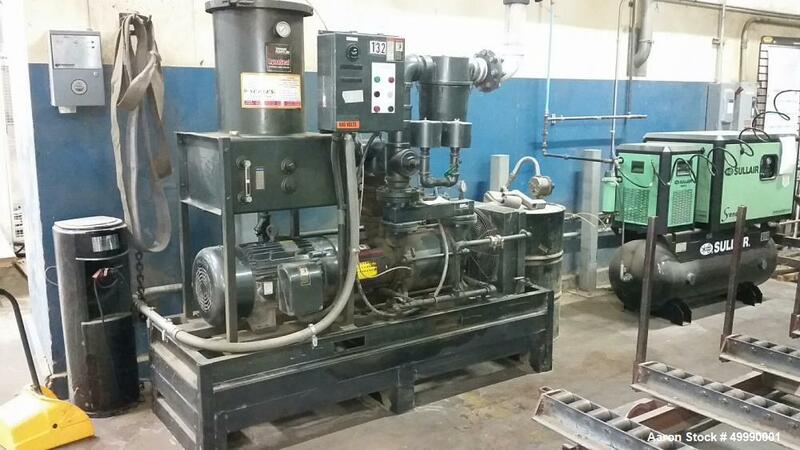 Used- Premier Fluid Systems Vacuum Pump System, Approximate 353 Total CFM, Model TRW-200V-DPR. 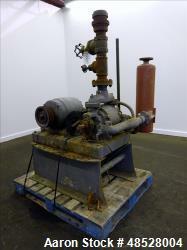 Consists of (2) Travaini liquid ring vacuum pumps, model TRVA 65-300/C/GH, cast iron. 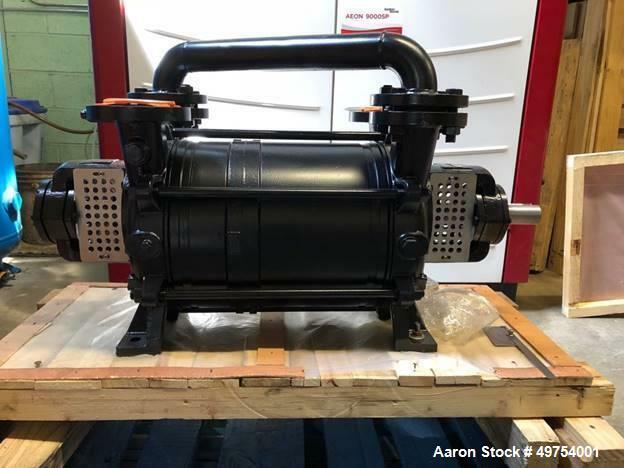 Each pump driven by a 15hp, 3/60/208-230/460 volt, 1755 rpm motors. Includes a control panel. Frame mounted. Serial# AD-626 & AD-629, built 2007. 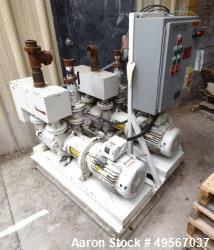 Used- Travaini Vacuum Pump, Model TR0500S-1A. 15" Hg Vacuum, 60-120 degree F Ambient Temperatures. 180 degree F Inlet Gas Temperature Maximum 180 degree F Discharge Gas/Oil Temperature. 230/460 V; 3 phase; 1765 rpm; 40 hp. 83" long x 35" wide x 64" high. Approximately 2,150 pounds. 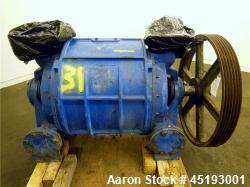 Unused- Nash Main Condenser Exhaust System, Model AT-3400E, Carbon Steel. 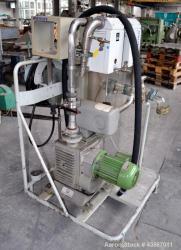 Consists of: (1) Nash 2 stage liquid ring vacuum pump, model AT-3004E, test #78U188, 450 rpm. Approximately 28.5" maximum vacuum, 2590 cfm. Driven by 200 hp, 3/60/230/460 volt, 1775 rpm motor thru a Falk gear drive, ratio 4.095 to 1. (1) Inlet manifold, (1) first stage discharge manifold, (1) second stage inlet and discharge manifold, (1) separator tank, and (1) 3 hp centrifugal pump. Skid mounted. Unused- Nash Main Condenser Exhaust System, Model AT-3400E, Carbon Steel. Consists of: (1) Nash 2 stage liquid ring vacuum pump, model AT-3004E, test #77U5205, 435 rpm. Approximately 28.5" maximum vacuum, 2590 cfm. Driven by 200 hp, 3/60/230/460 volt, 1775 rpm motor thru a Falk gear drive, ratio 4.095 to 1. 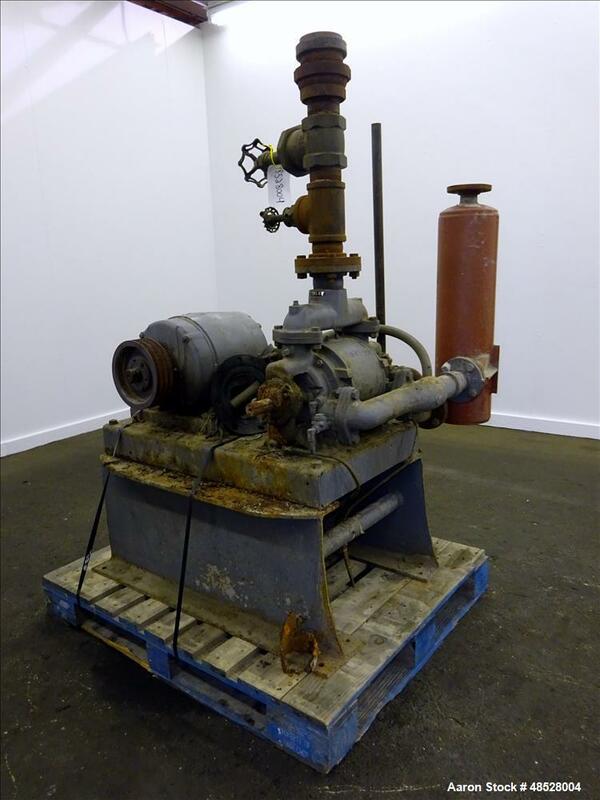 (1) Inlet manifold, (1) first stage discharge manifold, (1) second stage inlet and discharge manifold, (1) separator tank, and (1) 3 hp centrifugal pump. Skid mounted. Unused- Nash Main Condenser Exhaust System, Model AT-3400E, Carbon Steel. 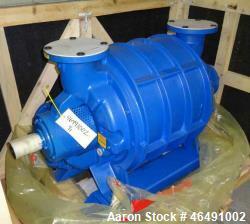 Consists of: (1) Nash 2 stage liquid ring vacuum pump, Model AT-3004E, test #77U5238, 435 rpm. Approximately 28.5" maximum vacuum, 2590 cfm. Driven by 200 hp, 3/60/230/460 volt, 1775 rpm motor thru a Falk gear drive, ratio 4.095 to 1. (1) Inlet manifold, (1) first stage discharge manifold, (1) second stage inlet and discharge manifold, (1) separator tank, and (1) 3 hp centrifugal pump. Skid mounted. 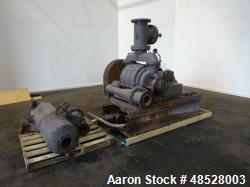 Unused- Nash Main Condenser Exhaust System, Model AT-3400E, Carbon Steel. 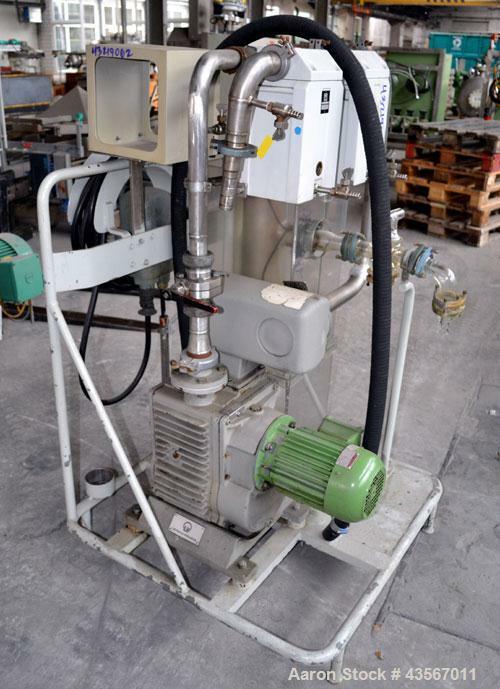 Consists of: (1) Nash 2 stage liquid ring vacuum pump, Model AT-3004E, test #77U5204, 435 rpm. Approximately 28.5" maximum vacuum, 2590 cfm. 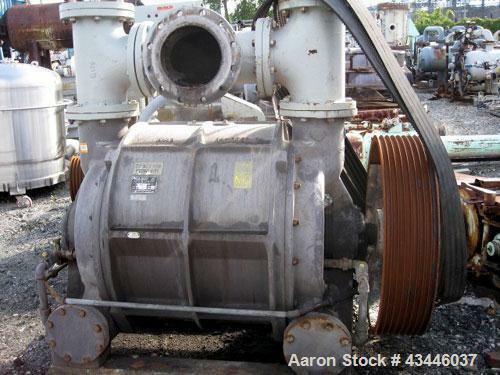 Driven by 200 hp, 3/60/230/460 volt, 1775 rpm motor thru a Falk gear drive, ratio 4.095 to 1. (1) Inlet manifold, (1) first stage discharge manifold, (1) second stage inlet and discharge manifold, (1) separator tank, and (1) 3 hp centrifugal pump. Skid mounted.